I’ve lived in the Mile End neighbourhood for most of my years in Montreal. Historically the area was very working class, but it started becoming “trendy” in the 80s and now, in 2018 we’re approaching peak gentrification. The best example of that might be the Lululemon that just opened on St Viateur. I don’t want to get into the gentrification debate here. There’s obviously some bad things that come as a result, but I also wonder where the “yuppies” are supposed to move if not to houses that are for sale, in areas where they want to live. 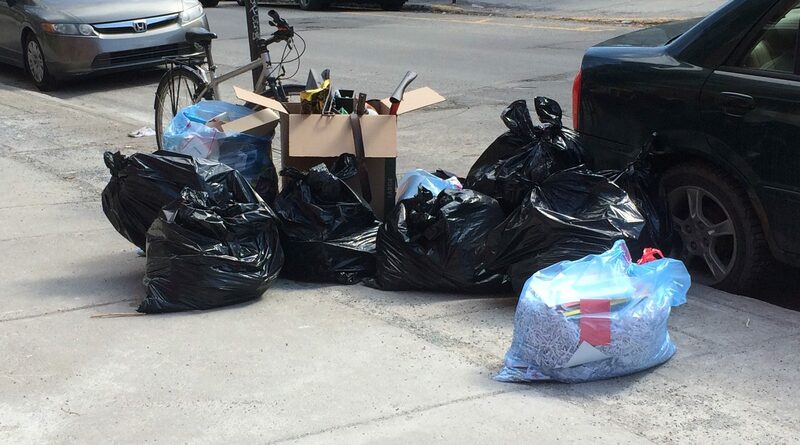 Regardless, I do know that gentrification improves the quality of the garbage in the neighbourhood. 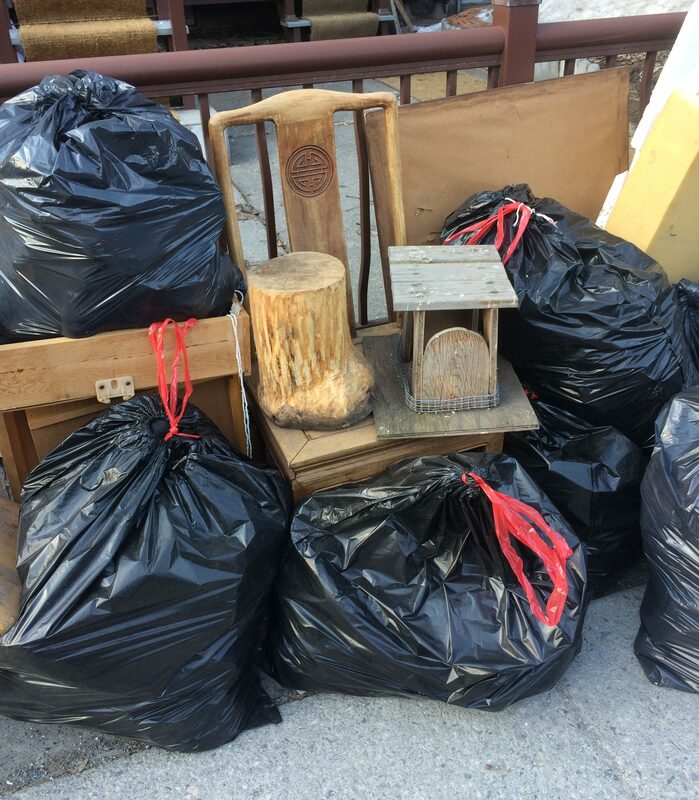 This pile of trash, for example was created by young people with disposable income, and I’m grateful for their contribution to my coffers! This bag in particular was excellent. At the top you can see perhaps the most valuable piece, an early 2010 MacBook Pro in a protective sleeve. The most obvious issue was the battery, which was bulging more than any I’ve seen previously. 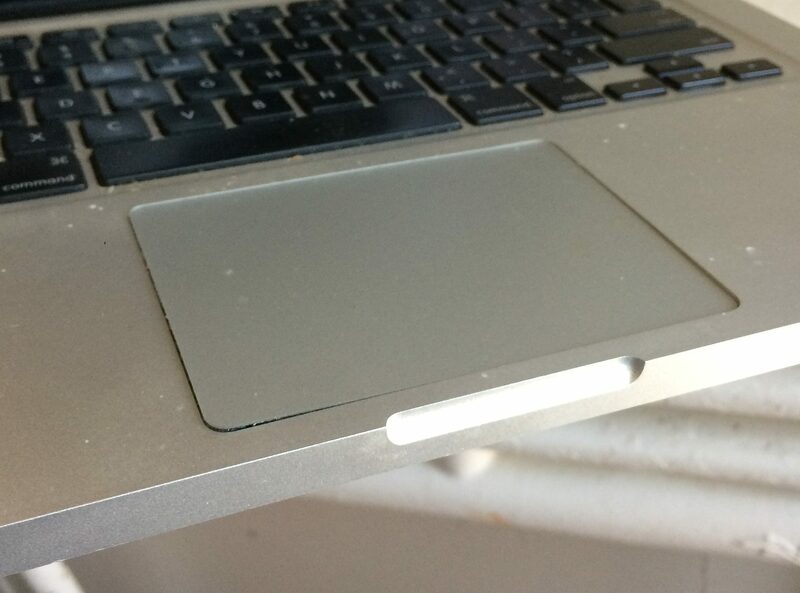 You can see how the left side of the trackpad is raised up, making it impossible to use the clicker. It’s a pretty common but (usually) easily fixable issue. Unfortunately, I stripped one of the screws while removing the battery and ended up basically ripping it out. I was nervous doing this – serious fires can occur if those lithium batteries are punctured – but after watching this video I felt more confident (he really bends those things!). In the end it all worked out, it just took longer than it should have. The laptop itself seems to work fine. Thankfully it’s pretty easy to delete people’s accounts and info through the recovery mode, and the laptop is now clean and ready to sell. 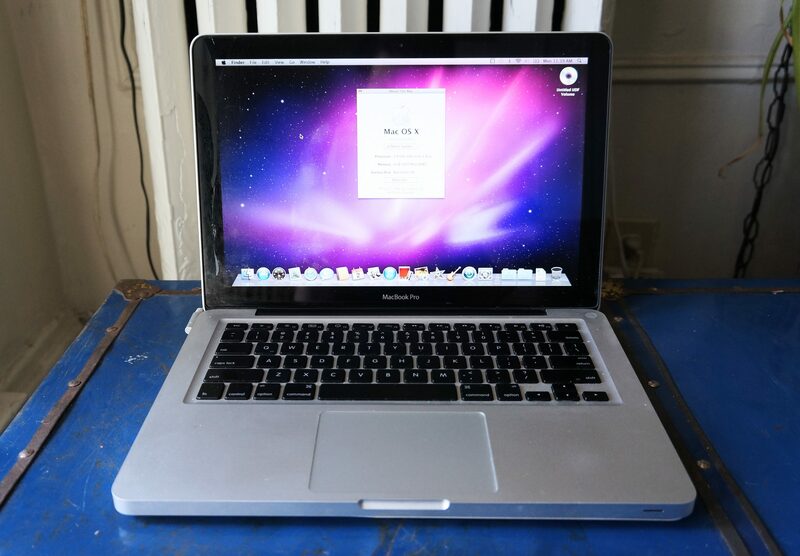 The screen is cracked on the left side (though not in a way that’s particularly noticeable) and the battery is missing, but this MBP should still sell for around 200$. Not bad! I’m always excited to see a Macbook Pro – they’re a near lock to be worth three figures, even when busted. That wasn’t all I found though. 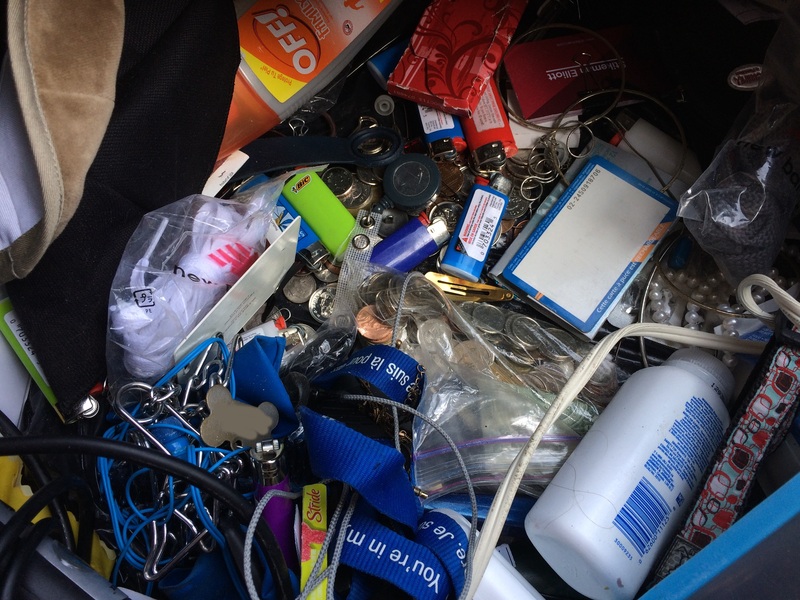 Here’s a look at the bottom of the bag – that’s where a lot of the smaller valuables often end up. You probably noticed the coins in the last picture. 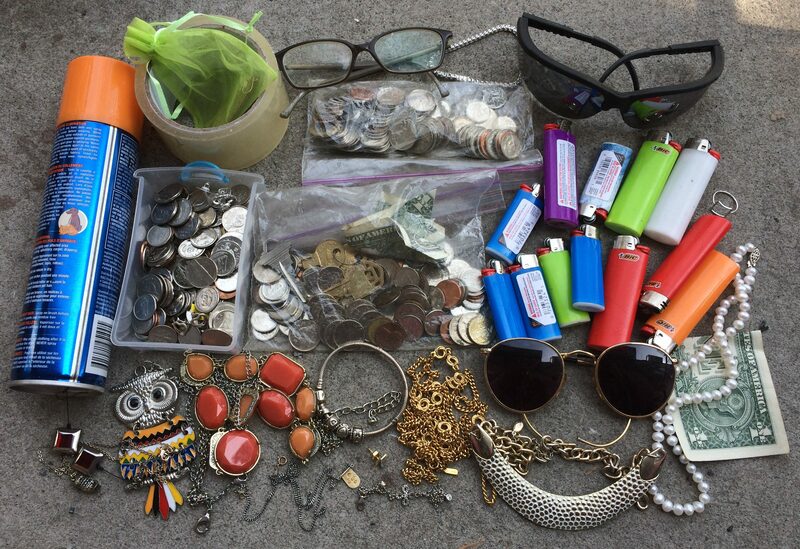 There were two little ziplock bags full, plus some loose change at the bottom of the bag. There were also two American dollar bills (I feel like I’ve found a bunch of these lately). Overall, I’d guess the bags contain between 15-20$. I found 12 lighters – all of them worked. That’s a ridiculous number, so I’m guessing this person was the type to steal lighters at parties. I don’t smoke, but I gave them to friends who do. I also saved some jewelry. Most was either decent costume stuff or crap that wasn’t worth saving, but a few pieces were quite nice. 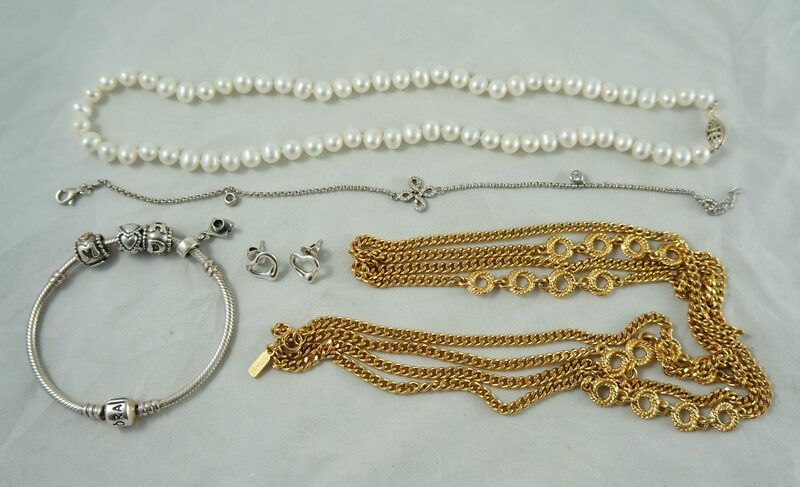 The necklace on top seems to be made from real pearls. I don’t think it’s worth much, but it’s nice regardless. The second bracelet is sterling silver, while the necklace on the right is made by Monet, a quality costume jewelry designer. The best pieces are on the left. The silver bracelet is by Pandora, a well-known Danish manufacturer. I’ve found fakes before but I’m confident that this one is legit. The silver charms (most of which sell for 90$ each) include “mom”, “dad”, a series of hearts, and a graduation cap. Based on that, I’d guess that this was an underappreciated graduation gift. Buying something like this new would cost around 500$, so I’m hoping that someone will bite at my listed price of 220$. The earrings beside them are Tiffany, and I’m confident they’re legit because the production quality matches the name. It’s an Elsa Peretti design, and they should sell for between 80-100$. When all is said and done this trash should make me over 500$. Not bad! (Not pictured: a Starbucks gift card that had 6$ on it, and some decent headphones that I gave to my sister). The Mile End is definitely getting gentrified, but there’s still a lot of folks here who’ve been around since the old days. Their trash is usually more interesting than the younger peeps, in part because their stuff is vintage but also because that generation was generally more crafty – they needed to be. As such, their garbage produces more old tools, more handcrafted items, and more folk art (which is one of my favourite things to find). Most working class people of that generation didn’t throw much out either, so the trash (when it does come) sometimes features fun kitschy knick-knacks, cool paper ephemera, and other things you don’t see anywhere else. Looking for this stuff is like trying to find a needle in a haystack, but occasionally I get lucky. This spot, which I happened upon during my first bike run of the year, produced a few fun finds. You probably noticed that neat chair in the previous photo – it’s the first thing I noticed as well. I’ve never seen anything quite like it before, and because of that I knew I needed to save it. The chair is solidly built, and has a handmade feel to it. This symbol in particular made the chair pop out. 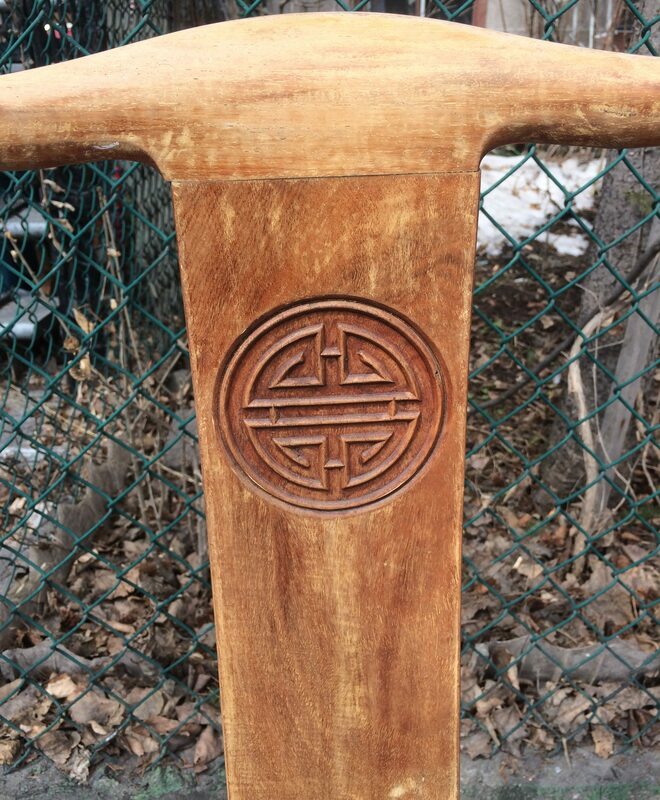 According to one of my Instagram followers it’s a stylized Chinese symbol of fortune, and based on a quick Google search I think she’s right. 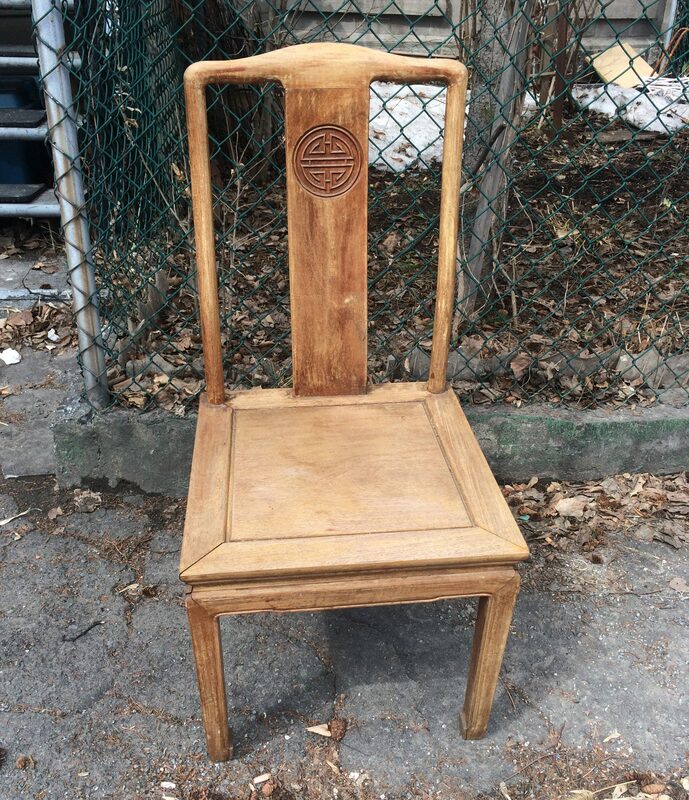 Has anyone else seen a chair like this? I had no luck during my brief Google search. 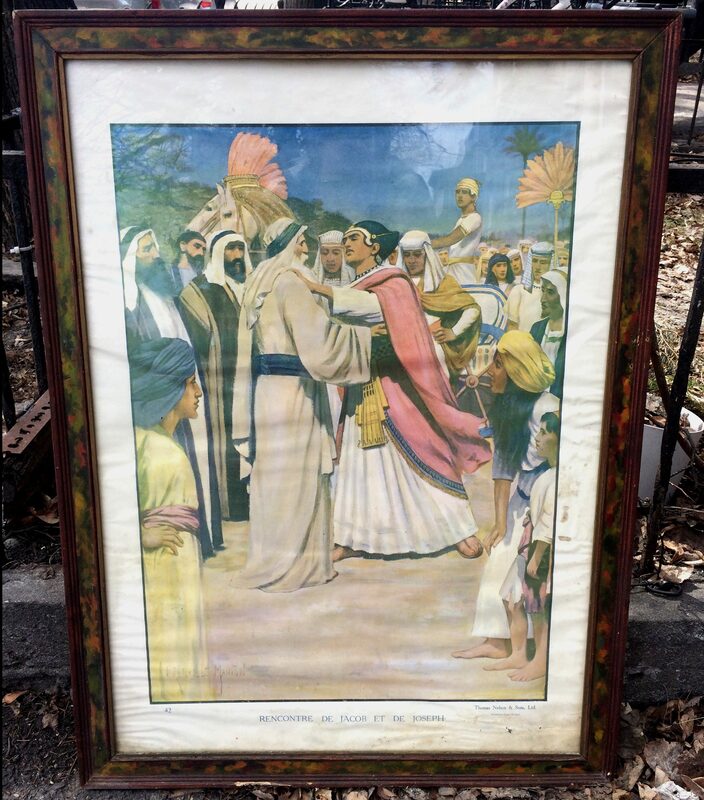 Behind the chair was this framed print titled “Recontre de Jacob et de Joseph.” It was made by Thomas Nelson & Sons, a publisher that put out a lot of religious materials back in the day. I didn’t find any reference to the existence of this poster on Google, however. It’s quite large, measuring roughly 3′ x 2′, and should sell at a yard sale. If I were to guess I’d say it dates to the 30s or 40s. 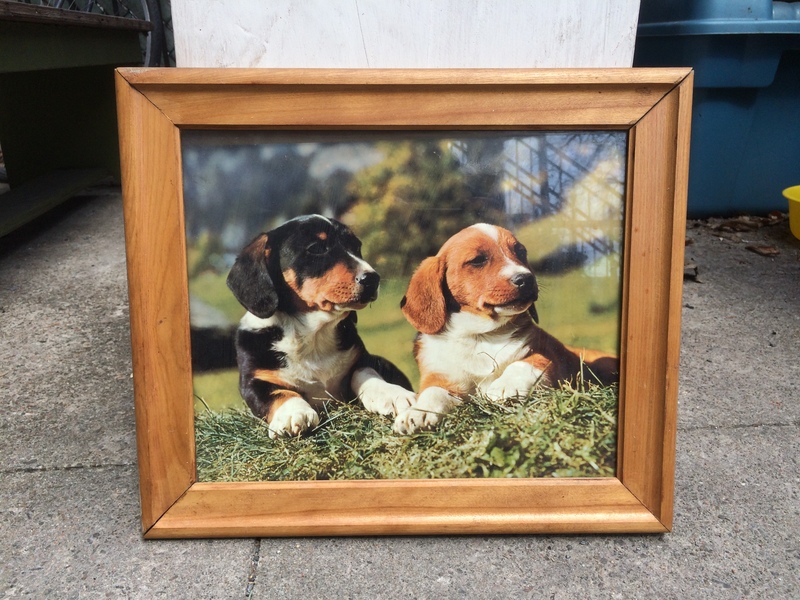 I found a couple nice things inside the bags, including these cute framed puppies (likely from the 70s). 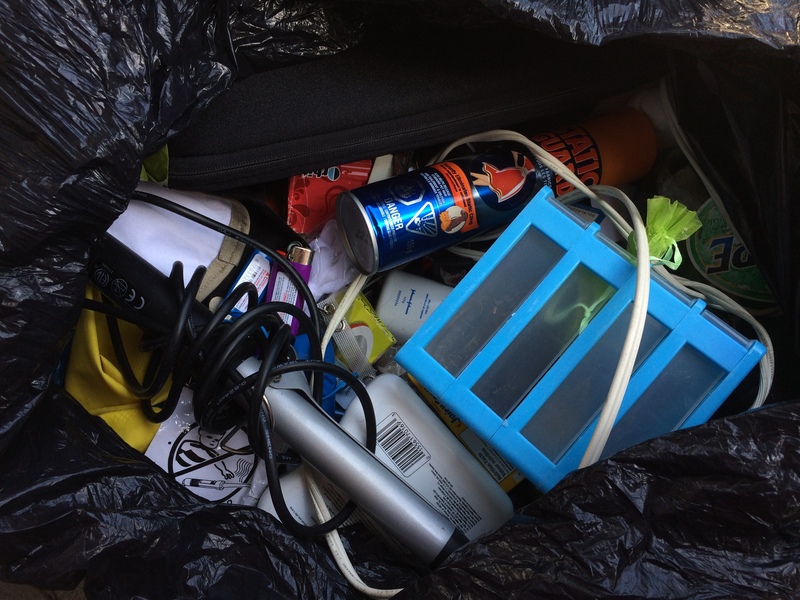 In the interest in transparency – I also found some poop in those bags. I’m usually good at avoiding the gross stuff, but this time I got some on my hand. Gross. Oh well, it’s nothing that wouldn’t clean off. Fortunately this pile wasn’t far from my house, so it wasn’t long before I could wash my hands. One great thing about having trash picked for so long is that I’ve pretty much seen all the junk there is to see. So, when I see something I haven’t seen before, that often means that it’s a thing with some amount of value. 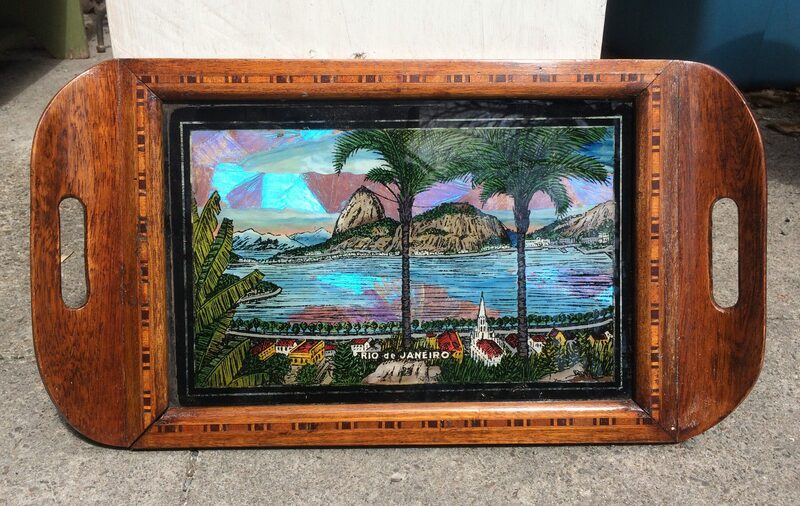 This Rio de Janeiro wooden tray is a good example of that. I’ve seen a lot of crappy tourist stuff in my time, but this tray was very beautiful and looked relatively old. I did some research – only then did I realized that a lot of the iridescence in the image comes from butterfly wings. Zoom in for a closer look! It’s a neat piece, and it seems that these sorts of trays sell for around 60$ on eBay, give or take. It probably dates back to the 40s or 50s. The rest of the stuff in those bags was worn out crap that nobody would want, but I’ll check back in the coming weeks to see if anything else gets cleared out. Elsewhere in the Mile End I found a vintage nativity set, probably from the 50s or 60s. Just another blast into the Mile End’s past – the young people moving in aren’t generally bringing nativity scenes. I shouldn’t have any trouble selling this at a yard sale. Now that it’s getting warmer out I’ll probably cover this route more often. I usually do it by bike, so it’s a good way to get some exercise. Also, I do get sick of driving sometimes! I still have to document my finds from last week, which I’ll get a friend to help me with in the coming days. Otherwise, I’m expecting the early part of this week to be busy again, though you never know with garbage. I’ll let you know how it goes! 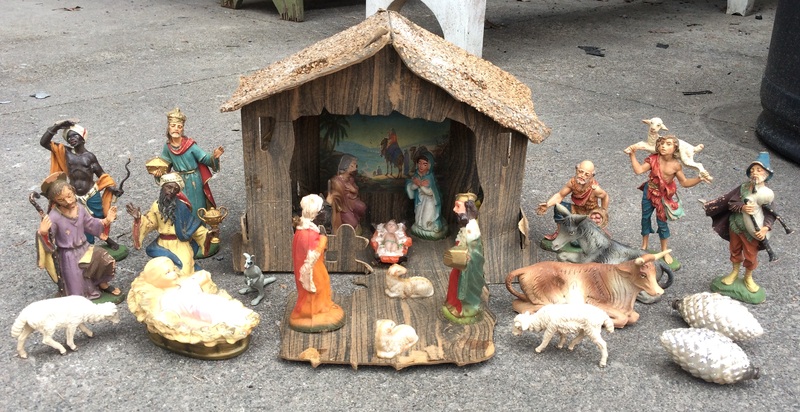 Nativity scenes do well on ebay and you’ll get more for it than at a yard sale. Yes, you should put that nativity scene on ebay! The one you have has very unique figures . Especially the herder with the sheep on his shoulders and the one playing a flute. I’ve never seen a nativity scene with these unique of figures before. Cool find! We have that exact set. My mother likely purchased it in Montreal in the early 60’s. However, I don’t think that big baby Jesus on the left belongs to this particular set though. Must have been another set much larger than this one. Thanks for the info. The Jesus is a different set indeed, it’s made from a different material for one. It is incredible people throw out so much money and loose change in the garbage.Just incredible.Congratulations. Great finds Martin! Regarding the Pandora. I have one and just a few years ago – 2-3, if you bought for $125 you got the bracelet for free and the charms shown were worth 40-50$ each. If the bracelet was bought separately you can still buy it for $80-85. So you might get some bargaining on your price of $220. Thanks for the info, I found it hard to research Pandora because a lot of the listings on eBay are cheaper beads with the keyword “Pandora.” I’ll see how it goes, I can always lower the price if it doesn’t sell (plus, since people will be graduating from various schools in the coming months there might be a relatively strong market for a bracelet with these types of beads). I was thinking he might do better to sell the bracelet and each charm separately since I think it might be easier to find someone who wants components rather than the whole thing. But, of course, that’s more work. I was thinking the same thing. I think there are some charms that are worth more than others (although doubtful on this one given it was so obviously unloved). I have to say I much much prefer normal charm bracelets to the overmarketed pandoras, but i seem to be in a bit of a minority as so many people i know are obsessed by them. My favourite parts of this post are the observations you’ve shared about what kind of things people of particular generations or income levels consider “garbage.” Very interesting! Nice haul. Looking at that lovely chair, the thought crossed my mind that it may originally have been lacquered and have been stripped by someone. I have seen similar chairs and they were always lacquered. Do you know what kind of wood it is? That could give a clue as to origin. No idea, I don’t know my wood. It’s nice though. I’ll make a note to show you the pearls. Hi Martin; Love your blog. I have to remark about that chair, I have a dining room table set with six armless chairs and two armed chairs. While the riser is different, the seat and legs look identical. My set came from China and are at least as old as 1940 which is when they were purchased. And yes they are lacquered a darker colour, but the similarities in the seat and legs is remarkable. I tried to send you a pic but don’t know how to do that as there are no buttons. I could add it via facebook if you like. Good to know, thanks! Yes, post a picture on the Facebook, or send it in a message. I’d be curious to see. I put those in a free box on the curb actually, they got taken pretty quickly. I keep those drawers sometimes but I have enough at the moment (and I see them pretty regularly). Right now I don’t really have the space for copper / metal salvaging. Maybe once I get my garage better organized, right now there’s too much other stuff in there. There’s good money in metals though. Those plastic drawer sorters are everywhere in the trash here. I normally put them on the curb in a free box also, but lately I’ve been bringing the very small ones to my kids’ elementary school. The teachers like them for sorting small items. Just a thought if you have a local public school nearby. FYI I collect old Christmas stuff and the prior commentor was correct, sell it on EBAY. Plus, separate those two old pinecone ornaments (worth $10-20 as a pair) into a separate Christmas vintage listing on EBAY. They are super light and easy to package. People are very nostalgic about old Christmas stuff and buy it year round at decent prices. Hmmm, thanks I’ll look into it. Selling things at yard sales is tempting though because I can’t possibly list every quality item I find on eBay. I’d have thousands of items up, and no life. So, I have to pick my spots. I love when you go into the history and makeup of the different neighbourhoods. Life’s a learning curve, and learning from your posts is fun. You’re very clever at testing the electronics you find, and getting a good many of them into saleable condition … an enterprising young man in the best sense of the word. Ooo … Ooo! More change to roll! I see a lot of great items for ebay and (near-future) yard-selling! Thankee for another interesting post. It is shocking that people would throw out the framed puppy photos in black garbage bags.People are so dumb and backwards. Some very nice finds on this post. I’m curious about the orange stone necklace beside the owl piece. Do you think it’s costume, or something more? Glad you like it! That piece is definitely plastic and fairly light, not anything super special by my estimation. Decent yard sale costume jewelry though. Another awesome post. Sorry to read about the poop!!! And who knew that someone might use butterfly wings to create an iridescent effect on something like a tray?! Yes I found that in the fall but haven’t mentioned it on the blog yet. That price might be high, but I figured it was worth a try (especially after I saw that this fruit bowl went for 4k+ recently – https://www.ebay.ca/itm/Carl-Poul-Petersen-Solid-925-handmade-Sterling-Fruit-Bowl/183134167256?hash=item2aa3a5a0d8:g:xRYAAOSwlL1atV-F). If you ask for too much you can always lower the price, if you ask for too little you can’t take it back! I agree with the earlier commenters, please put the nativity scene on eBay. My mother collects these sets and I’m sure a lot of other people do, too. The religious scene is from Genesis. A short version of the story: Joseph (17), the next to youngest of 12 brothers, is his dad’s (Jacob) favorite. Dad buys him a fancy coat and Joseph gets all braggy about it. His older brothers finally have had enough and sell him to some passing slavers. They take the coat back to Jacob smeared with sheep’s blood and tell him Joseph must have been eaten by a wild animal. Joseph is sold to an Egyptian and becomes very important in the man’s house until he refuses to sleep with the man’s wife and she gets him thrown in jail. In jail, he gains a reputation of being able to interpret dreams, which leads to his being taken to pharaoh to interpret some scary ones his highness has had lately. The dreams foretell a horrible famine and Joseph suggests ways to make things easier on the Egyptians. During the famine, Joseph’s brothers come to buy grain (Egypt is the only place that has any) and Joseph recognizes them. They are sorry and he forgives them. He sends them home to bring the whole family because the famine still has some time to go before it is over. The scene you have is of Jacob seeing Joseph, whom he thought was dead, for the first time in 20 years. Thanks for the backstory, I am not particularly familiar with the stories of the bible. I looked up nativity sets on eBay and they do seem to sell for a good amount. I’ll set them aside and do that sometime soon, or maybe in the fall. I have a Brazilian butterfly tray also….my father in law was in the merchant marines in 1939 and made a stop in Rio…..obviously no longer make these due to butterfly wings…i can’t believe someone would throw that away……i would never part with mine….it’s quite a conversation piece….I’ll be curious to see what u sell it for. Interesting, glad to hear the story behind yours. Mine sold pretty quickly for 70$. Maybe I could have gotten more for it, but I consider that a good profit.